Today Match Prediction of Melbourne Stars vs Hobart Hurricanes, 31st Match Preview, Playing 11, Injury updates, News and Dream11 Prediction. If you are looking for HBH vs MLS Dream11 Prediction then you are are the right place. Melbourne Stars is all set to take on the Hobart Hurricanes on Monday, January 14, 2019, at Melbourne Cricket Ground, Melbourne. If you want to know who will win then you are in the right place. In Today’s Dream11 Fantasy Cricket Match of HBH vs MLS, we will cover Pitch Report of Melbourne Cricket Ground, Melbourne, Predicted Playing 11, Toss Prediction, and Fantasy Cricket News and Tips. You May like to Read MS-W vs SS-W Dream11 56th Match Prediction. Who Will Win Today Between HBH vs MLS 31st Match? Hobart Hurricanes who is at the top of the points table will take on Melbourne Stars who is sitting on the second last position of the points table. Both the teams had a contrasting result so far in this tournament. HBH has won back to back matches whereas MSL has lost back to back matches. Melbourne Stars has played seven matches, won three and lost four matches so far in this BBL 2019. They are in the seventh position of the points table with six points in their pocket. MLS have lost their last two matches back to back. The middle-order is consistently struggling and this department is costing them the game. Ben Dunk, Nick Larkin, and Evan Gulbis are the top scorers of Melbourne Stars. They have scored 143, 143 and 89 runs respectively. GJ Maxwell and MP Stoinis who are among the top scorers are with Australia Team and will not play. Dwayne Bravo, Liam Plunkett and Scott Boland are the top wicket-takers of MLS. They have taken 9, 6 and 5 wickets respectively. S Lamichhane who is one of the top wicket-taker is not in the squad as he is playing BPL. Hobart Hurricanes have played six matches, won five and lost one match in this Big Bash League 2018-19. They are in the first position of the points table with ten points in their pocket. 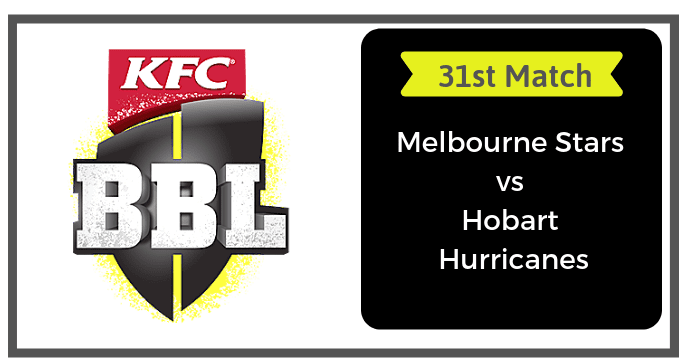 HBH has won all the five matches back to back but they lost their last match against Melbourne Renegades. The top order failed to perform which costed them a game. D’Arcy Short, Matthew Wade and George Bailey are the top scorers of the Hobart Hurricanes team. They have scored 259, 190 and 173 runs respectively. D’Arcy Short have consistently performed. He scored runs at an average of 43.16 runs. James Faulkner, Riley Meredith and Jofra Archer are the top wicket-takers. They have taken 10, 7 and 7 wickets respectively. D’Arcy Short has also contributed with the bowl and took 4 wickets. The Melbourne Stars have made one change in their squad and Hobart Hurricanes have named the same squad for 31st Match of BBL. You can read the complete team details and Dream 11 prediction below. Evan Gulbis, Ben Dunk, Nick Larkin, Dwayne Bravo, Liam Plunkett, Scott Boland and Nic Maddinson are the key players of Melbourne Stars Team. Nic Maddinson will lead the MLS Team. The MLS team management has announced 13-players squad. They have made one change in their squad. Spinner Tom O’Connell has replaced Michael Beer. Evan Gulbis, Ben Dunk and Nick Larkin will lead the batting department. Liam Plunkett, Scott Boland and Dwayne Bravo will lead the bowling department. The Stars may play with the same playing 11 or they may give Tom O’Connell a chance in place of Liam Bowe. Batsmen: Ben Dunk, Evan Gulbis, Nic Maddinson, Nick Larkin. All-Rounders: Jonathan Merlo, Dwayne Bravo. Bowlers: Liam Plunkett, Jackson Bird, Scott Boland, Liam Bowe/Tom O’Connell. Nic Maddinson (C), Scott Boland, Dwayne Bravo, Seb Gotch, Nick Larkin, Lance Morris, Liam Plunkett, Jackson Bird, Ben Dunk, Jonathan Merlo, Liam Bowe, Evan Gulbis, Tom O’Connell. Matthew Wade, D Arcy Short, Ben McDermott, George Bailey, James Faulkner, Jofra Archer and Riley Meredith are the key players of Hobart Hurricanes Team. Matthew Wade will lead the HBH team. The HBH team management has announced unchanged 13 players squad. Matthew Wade, D Arcy Short, and Ben McDermott will lead the batting department. James Faulkner, Jofra Archer and Riley Meredith will lead the bowling department. D Arcy Short is one of the most valuable players of the Hurricanes Team. The Hobart Hurricanes team may play with the same playing 11. Batsmen: George Bailey, Alex Doolan, Ben McDermott, D Arcy Short. All-Rounders: Simon Milenko, Johan Botha, James Faulkner. Bowlers: Jofra Archer, Clive Rose, Riley Meredith. Matthew Wade (C), Johan Botha, Jake Doran, Ben McDermott, Simon Milenko, Clive Rose, D’Arcy Short, Jofra Archer, George Bailey, Alex Doolan, James Faulkner, Riley Meredith, David Moody. Fantasy Cricket Pro Tips: The above players are most likely to perform today. You can take them as a captain and vice-captain. You can also take captains from playing 11. If we look at the last five matches, Melbourne Stars have dominated Hobart Hurricanes. MLS has won three matches out of five whereas HBH has won only two games. The stars have defeated the Hurricanes in the last BBL 2019 match. The MLS team has won one out of two matches played on this ground. According to Crix11 astrology prediction, HBH will win the match today. The team winning the toss should opt to bowl first as the fast bowlers may get some initial help. According to crix11 astrology prediction, HBH will win the toss and ask MLS to bat first. The match will be played on Monday, January 14, 2019. Match Big Bash League (BBL) 2018-19, MLS vs HBH, 31st Match. Venue Melbourne, Melbourne Cricket Ground. Time 08:15 AM GMT, 01:45 PM IST, 07:15 PM LOCAL. The pitch of Melbourne Cricket Ground is considered to favour the batsmen and the fast bowlers. There will be a fine competition between the bat and the ball. The fast bowlers may get some additional help from the wicket in the initial couple of overs. The batsmen can easily score runs once the ball gets old. Dream11 Fantasy Cricket Tips: Try to take quality batsmen and quality fast bowlers. A hot and humid day is forecasted today. It is predicted to be a sunny day and it will remain the same throughout the day. There is no sign of rain and the temperature is expected to be 28-Degree Celsius and the humidity to be 54%, which may go up to 84%. HBH vs MLS Dream11 Tip of the Match: Try to take five top-order batsmen, two all-rounders and three fast bowlers. This is it for Today’s HBH vs MLS Dream11 Fantasy Cricket Match Prediction of 31st Match. Read the complete post and win in any fantasy cricket league. Leave a comment below and share the post so that others can also find Crix11 which is the best fantasy cricket prediction site. Don’t forget all the information on this website is absolutely free and if you utilize the data correctly your winning chances is 100% sure.